From the $59 billion Shire acquisition by Takeda, to the $800 million that United Therapeutics paid upfront for Arena’s pulmonary arterial hypertension drug candidate ralinepag, 2018 was a year punctuated by product and company valuations that sometimes seemed out of sync with reality. Evaluate's Jon Moser and Paul Verdin explore the landscape of high-value unpartnered assets. From the $59 billion Shire acquisition by Takeda, to the $800 million that United Therapeutics paid upfront for Arena’s pulmonary arterial hypertension drug candidate ralinepag, 2018 was a year punctuated by product and company valuations that sometimes seemed out of sync with reality. Against a backdrop of big pharma lamenting the lack of available high-quality opportunities, and seemingly becoming more averse to M&A (the recent BMS–Celgene announcement aside), EvaluatePharma has identified the most valuable assets which remained unpartnered at the end of 2018. The assets are ordered according to their net present value (NPV) in Table 1, with the top asset being argenx’s anti-neonatal Fc receptor monoclonal antibody ARGX-113, which is expected to compete with Alexion’s Soliris in myasthenia gravis. Next in the list is bluebird bio’s LentiGlobin gene therapy, which is seen as potentially paving the way to a cure for beta thalassemia and sickle cell disease. It is one of two gene therapies in the list, demonstrating the evolution of novel therapeutic modalities. 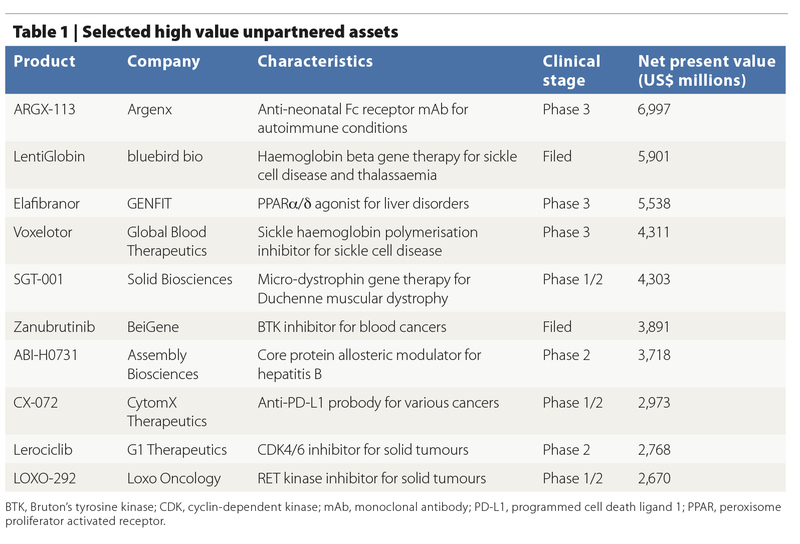 Given the high level of deal-making activity in the oncology area, it is perhaps a little surprising that four of the highest value un-partnered assets are cancer drugs. Finally, products for liver disorders with high unmet needs and substantial recent biopharma investment, including nonalcoholic steatohepatitis and hepatitis B, also feature in the list. BTK, Bruton's tyrosine kinase; CDK, cyclin-dependent kinase; mAb, monoclonal antibody; PD-L1, programmed cell death ligand 1; PPAR, peroxisome proliferator activated receptor. A previous analysis of un-partnered assets conducted a year ago using EvaluatePharma data identified ten products, of which just one (the sickle cell therapy voxelotor) remains in the top ten in this year’s rankings. Seven of these products have slid down the rankings, with none of them receiving approval or securing a partner to date. Interestingly, the two remaining products, glembatumumab vedotin and NEOD001, have subsequently been abandoned following negative clinical trial results. This showcases the unpredictability inherent in pharma R&D, highlighting the challenges facing deal-makers in today’s biopharma ecosystem. It's possible that some of these companies do not want to partner at this stage. Or, as you suggest, perhaps there are issues with these candidates that make them unattractive (i.e., highly competitive indication, high COGS, better licensing alternatives, safety or other issues not disclosed publicly, etc., etc.). Separately, I sincerely wish we had a more diverse mix of therapeutic areas.